Watch your back or you may get zapped! 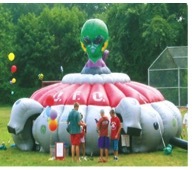 Using hand held laser guns, duck & hide so not to be seen by your opponents in this giant inflatable spaceship. Call 800-923-4386 or Email for a quote. You will be “amazed” at how much fun you will have trying to figure out how to get thru the winding passageways to find the hidden exit. Brace yourself! 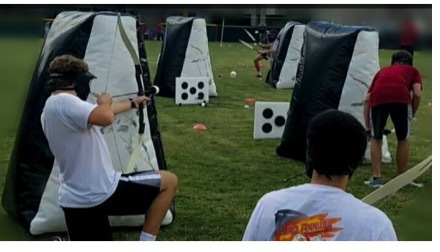 In this courageous attraction you will be gearing up and challenging your opponents to an archery match. Do you have the skill and accuracy to maneuver through the course without being hit? 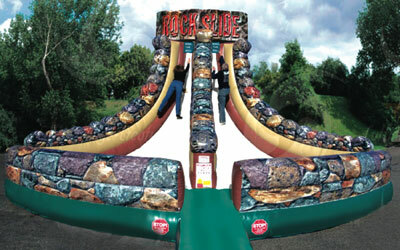 An obstacle course unlike any other! 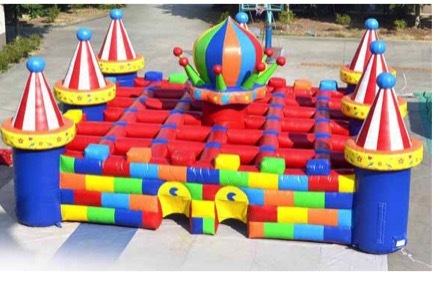 Designed to challenge and entertain, this giant obstacle course features four huge red inflatable balls surrounded by a blue ball pit resembling a moat filled with water. 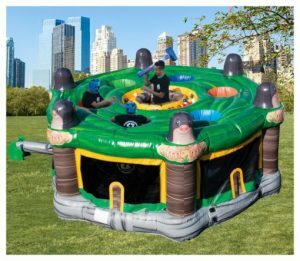 Players start on one side and must jump or run across the big balls to make it to the platform on the opposite side without falling in the ‘moat.’ The ball pit is cushioned with Zero Shock technology and feels like falling into water. 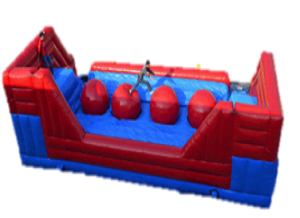 The sides of this red and blue obstacle course are cushioned and designed to make sure players who fall off the big balls fall safely into the Zero Shock zones. 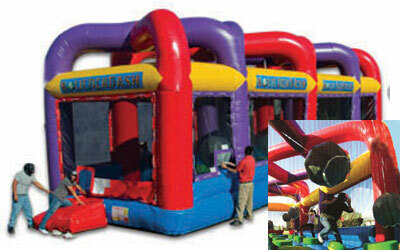 As much fun to watch as it is to play, the Big Baller obstacle course will make your next event fun for everyone! 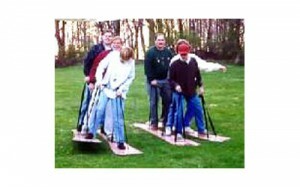 This fun and zany game consists of two teams of three people. Each team must work together as a group to get to the finish line. 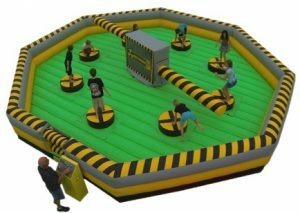 In Boulderdash, two opponents face off in head-to-head, zig-zagging across raised foam platforms while dodging swinging foam boulders thrown from six onlookers! The first person to make it across without falling off wins. Bubble Soccer puts a fun twist on playing soccer. Squeeze into your inflated bubble, harness up, grab the handle bars and have a blast smashing into one another while trying to score a goal. Rent 6, 8 or 10 bubbles. 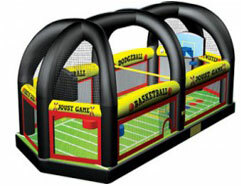 *Inflatable arena shown is not included, optional add-on. 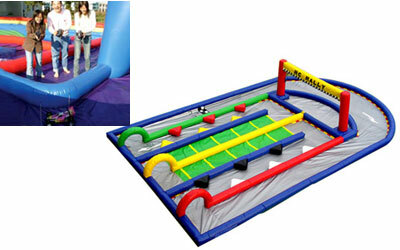 Bungee Challenge is designed as a tug of war game. 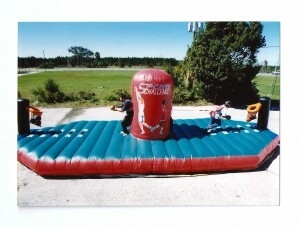 Opponents are connected to same bungee separated by an inflated pillar. 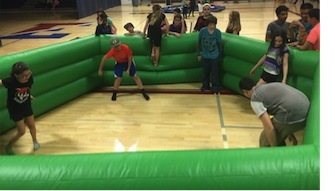 Participants pull away from each other either trying to score a basket or place a velcro football as far from the center as possible. Bungee Run is designed for each participant to be safely secured in a harness that is safely attached to a bungee cord. The participants compete by stretching the bungee cord as far as possible before being stopped in their tracks. Prepare to be challenged! Who can make their basket first? Head down your lane attached to your bungee, aim and shoot, but hurry before your bungee pulls you back. Introducing the Cannon Ball Air blaster. 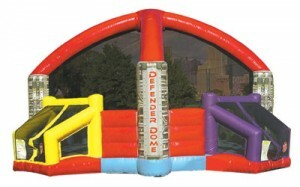 A 4-player game that allows participants to shoot their opponents with super soft foam balls. No explosions or loud bangs. The cannons run on a gentle, constant air flow making this game totally safe. Turn the game into a competition by aiming at the provided targets to see what team of players can make the most targets. All ages will enjoy this amazing new game! Enter into a world of royalty! Use your skills as you try to navigate through this captivating maze. Whack-a-mole with a twist! In this race against time, be the player to hit the most lights as they illuminate before time runs out. The highest score wins! Four players face off in the fastest moving inflatable game ever created. Throw as many dodgeballs into your opponent’s goals while defending your own! You can also play basketball with the built-in hoops. Racers get your pedals ready! Keep your eye on the light tree, when the light turns green, pedal as fast as you can down the 65’long 2-lane race track. Extreme Board Combo brings the best elements from the world of extreme action sports and puts it into one great game! 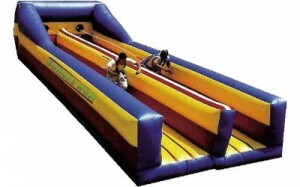 Snowboarding, Skateboarding and Surfing come together on our fantastic inflatable half pipe. Place your bets and get ready for fun! Riders will have a blast hopping down this three lane racetrack as the crowd cheers for their favorite horse! Three different size horses are provided. 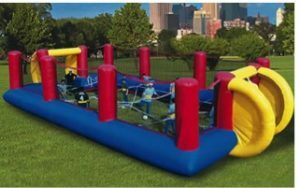 This classic game combines dodging, striking, running and jumping with the purpose of hitting opponents with a soft dodge ball below the waist while trying to avoid being hit yourself. The game can be played by a group of individuals versing each other, by teams, or in one-on-one matches. 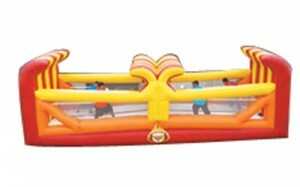 Knock your opponent off the pedestal onto the huge air inflated mat with your oversized, foam filled jousting poles. (Protective gloves and headgear provided). 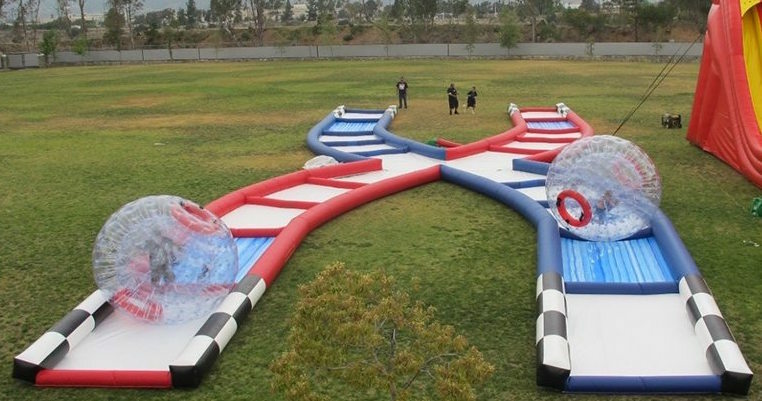 Strap into our life sized hamster ball as you roll your way to the finish line! 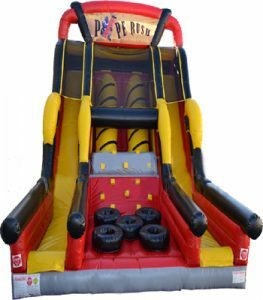 The criss cross course is a whopping 100′ long fit for kids and adults of all ages. The game can competitively accommodate 2 spheres at a time, and is filled with loads of fun! *Also available with out the track. 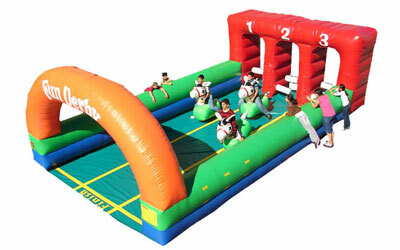 12 Contestants are fastened to ropes extending from side to side, allowing only sideways movement as they try to score a goal in this inflatable soccer arena. Description: The classic Whack-A-Mole game brought to life! Take a step into the center of the ring and do your best to *whack the “moles” attempting to grab the balls in your circle with your soft foam mallet. 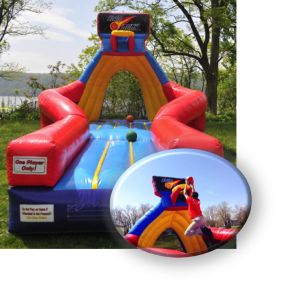 The referee yells “GO” and the players who are attached to their bungee cord make their way to the ball pit and grab as many balls as they can, then pedal backward and toss them in their mesh bag! Player with the most balls wins! 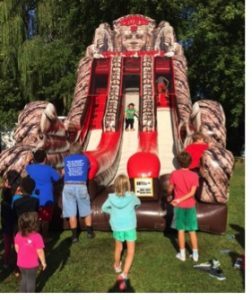 Test your balance and coordination and try to get to the top of this 10 foot rope ladder without flipping over. 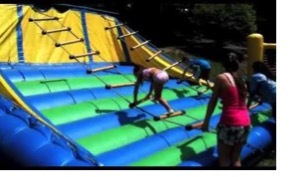 Can you survive the Log Slammer?! Four participants are trapped, floating in the swamp on tree stumps trying to avoid the swinging log stumps. Do you jump or do you duck? Either way, make sure you don’t get snapped up the by the hungry Alligators waiting for you! After thousands of years the Lost Temple’s stairs have crumbled. Test your speed and agility to be able to make your way up to the top by using its remaining steps. Your reward will be a fun slide down to the bottom. *If you want to experience a world of illumination, see our upgraded version, “Cosmic Clash”. Saddle up! How long can you last!? As the bull bucks and spins you around. Besides having fun, safety is our priority! 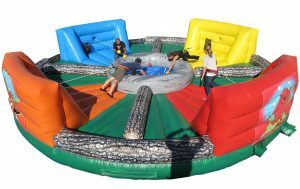 Our bull is equipped with a soft rubber head and horns as well as has an automatic cut off switch so when you fall off into the inflatable arena it automatically stops. Meltdown is our 7 player action game, which challenges your stamina, agility and reactions. Not One, but Two spinning boom arms try to knock you off your podium. 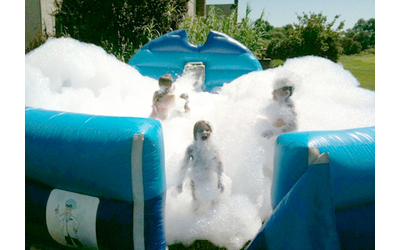 You have to duck underneath or jump over the foam boom. Who will be the last one standing? 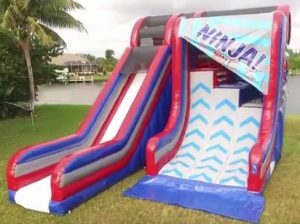 Description: Use your speed in an attempt to run up our Ninja Wall! This wall has three different heights to choose from. Do you think you have what it takes to master all three? Face off and behead your opponent. Suited up in your Knight’s costume, knock your competitor’s head off with your padded jousting pole. The Ultimate Challenge! 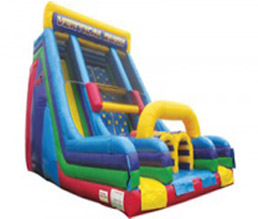 Participant will begin stepping through our tire shaped obstacles, then up the climbing cubes, and unique pipe shaped stairs to the top, finishing down the slide! 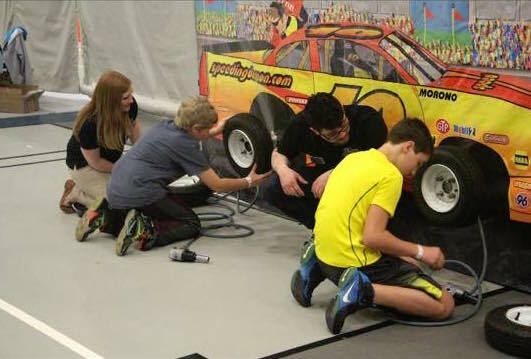 Can you change your tire the quickest on our fast-paced, high energy NASCAR attraction. Participants use real air-powered torque wrenches to loosen and tighten the lug nuts on the tires. The authentic sounds & colorful backdrop is sure to be hit at your next event. HOLE-IN-ONE! 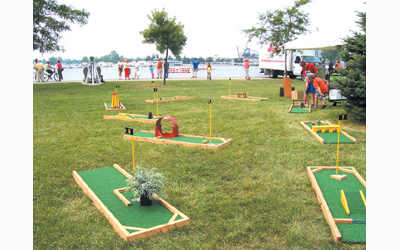 Our mini golf includes up to nine holes of fun. Each hole has its own unique obstacles for you to conquer. Every hole has a numbered flag on it so you can follow the order of the course. 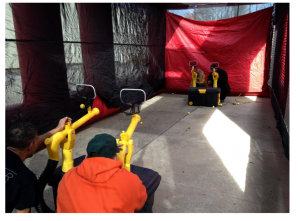 Teams of 2 dash to pass their balls thru the holes of netting in the center of the arena. The team with the least amount of balls wins. The Kicker? You and your opponent are attached by a bungee cord, so you are in a constant tug-a-war! Up to 4 can compete and race their remote controlled cars around the obstacles in over 250 feet of racing lane action. 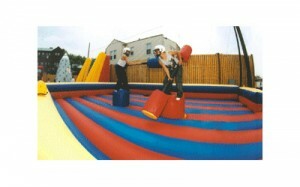 Two competing jousters balance themselves atop a raised pedestal that offers just enough play and movement. Overcome your worthy opponent and claim the pedestal. Test your balance and agility as you slip and slide up the slippery slope. Two people compete to see who can scale the slope to be the first to hit the bell at the top. 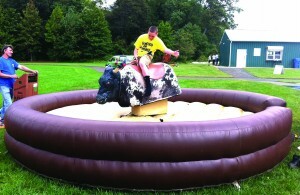 Experience the excitement of roping a calf, while sitting on a life size horse. Try and lasso the calf as it shoots out from under the horse on a 15′ L track. 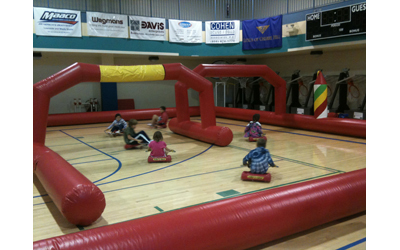 Race your friends around the inflatable track by using these self-propelled roller racers. By moving the handle bars back and forth the racer will start to move and as you continue you will build a good speed to race your friends. Six to eight people can race at one time. Time to make the highlight reels with our amazing Slam Dunk Basketball Challenge! 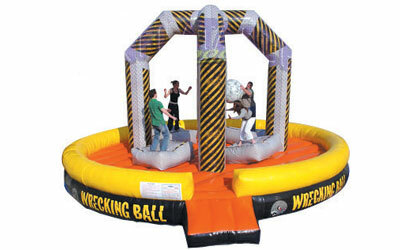 Each player takes three steps forward and launches off of the reinforced jump pillow to try and slam it home! Featuring big time fun in a small package, the Slam Dunk is great for any event! Description: Howdy partner! 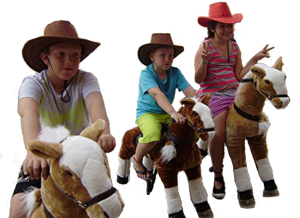 Take a ride on our new stuffed horses and race your opponents to the finish line! 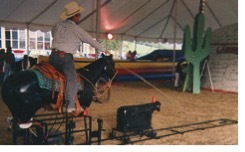 In this rodeo, the foot pedals help move your horse’s wheels forward as you steer your way to the finish line. 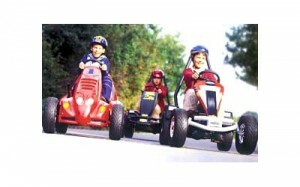 For an added good time, ask about our racing arena! 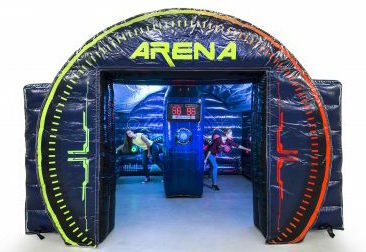 Satisfy the ultimate sports fan with our all in one sports arena. 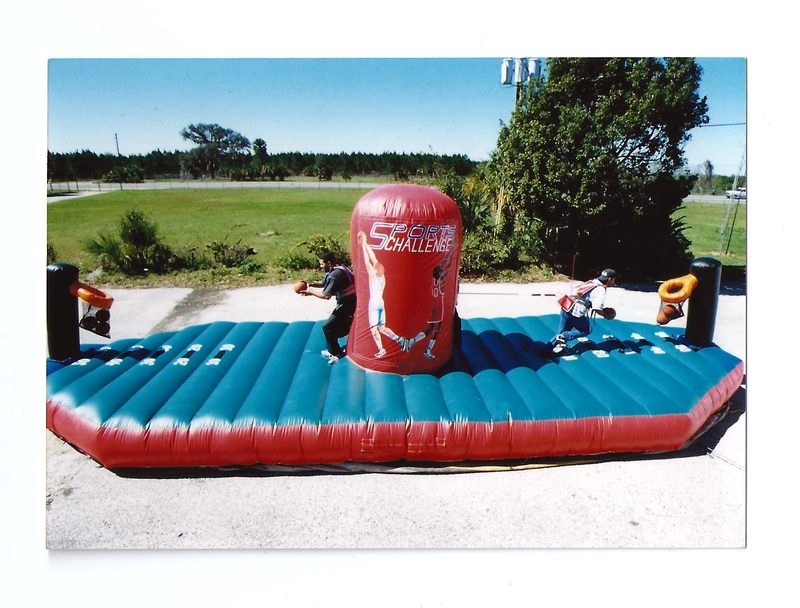 Enjoy traditional team sports like basketball and soccer as well as volleyball, bungee challenge and gladiator joust. 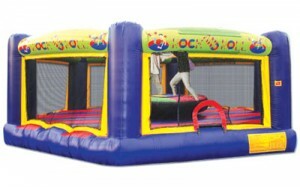 Children can also use it as bounce and shoot baskets. Mesh sides allow for easy viewing. 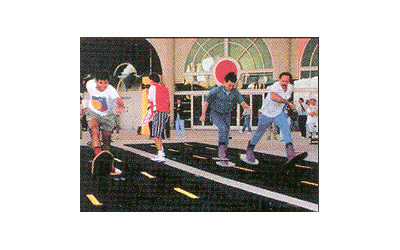 Two participants race down this velcro covered track wearing velcro covered boot soles. Velcro soled boots come in adult and child sizes. Are you going to be the next to get caught in the spider’s web? 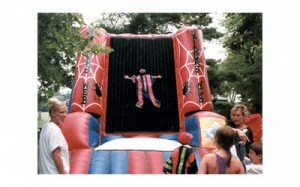 Leap high wearing a velcro suit and stick to the giant air filled velcro wall. Are you ready to experience the ultimate rush? It’s a Rock Wall! It’s a Slide! It’s an Obstacle Course! 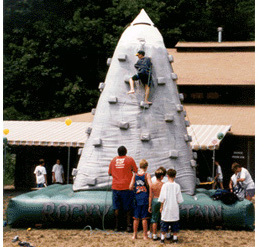 Race your opponent through the obstacles, climb up the rock wall and slip down the slide as fast as you can and and feel what is known as the “Vertical Rush”. Balancing atop their inflated pads up to four players attempt to grab and push the swinging “Wrecking Ball” into their opponents, trying to knock them off their pads. The last player standing is the champion. Circus Time Amusements - Serving-New Jersey, Pennsylvania, Delaware, New York & Maryland.